Cachuma Lake is a reservoir in the Santa Ynez Valley of central Santa Barbara County, California on the Santa Ynez River adjoining the north side of California State Route 154. The artificial lake was created by the construction of Bradbury Dam, a 201 ft (61 m) earth-fill structure built by the U.S. Bureau of Reclamation in 1953. Its surface area covers 3,100 acres (1,300 ha), with a maximum design capacity of 205,000 acre⋅ft (253,000,000 m3), but it is currently limited to 188,000 acre⋅ft (232,000,000 m3) due to sediment accumulation. As of March 28, 2019, it is at 78.0% of capacity. Built by the U.S. Bureau of Reclamation in 1953, the name "Cachuma" comes from a Chumash village that the Spanish spelled "Aquitsumu", from the Barbareno Chumash word aqitsu'm, meaning "sign". 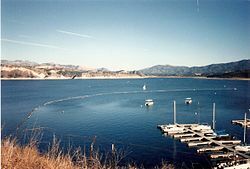 Body contact activities such as swimming, wading, or water skiing in Lake Cachuma have been restricted since the park opened in the 1950s, reasoning that the lake was a reservoir people depend upon for drinking water. In May 2011, the no body contact regulation was revised to allow human-powered recreational watercraft such as kayaks and canoes on the lake as well as allow dogs on boats and eliminate "incidental body contact" with the water as a punishable offense. The water levels of the lake are highly variable, spilling in some years and receding to less than 10% of capacity in dry years. Drought conditions can cause shortage in water supplies, as did the 2011-17 drought. In October 2016, the lake approached low levels not seen since the construction of Bradbury Dam. The lake level reached a minimum of 646.42 ft (197.03 m) on October 14, more than 106 ft (32 m) below the spillway elevation. At this time, the storage volume was only 14,057 acre⋅ft (17,339,000 m3), approximately 7.3% of capacity. In January and February 2017, a series of frequent rains raised the water level substantially. On one day, February 17, 2017, the lake rose an astounding 25 feet during the storm alone, followed by further increases from storm runoff. By the end of February 2017, the Lake had become 44.5% full, with a total volume of 85,979 acre feet. The Lake's water level declined again during the 2017-18 water year, with the Lake receding to less than one-third of its capacity. However, by March 28, 2019, above-normal precipitation had restored Lake Cachuma to 78.0% of its capacity. Santa Barbara County Parks offers cabin and yurt rentals, as well as RV, tent, and group camping. Gasoline and groceries are available at the general store. There is a full boat and kayak rental facility with a bait and tackle shop where fishing licenses can be purchased. The lake is stocked with rainbow trout throughout the winter season, and fishing is open all year from shore or boat. There are five miles of hiking trails within the park, and Los Padres National Forest trails close by. A large campsite on the south shore of Cachuma Lake is administered by the Santa Barbara County Park's division of the Community Services Department. The University of California, Santa Barbara rowing team regularly practices and races at Lake Cachuma and erected a permanent boathouse there just prior to the 1982-1983 school year. The lake is also a popular destination for viewing bald eagles from seasonal tour boats. Solvang, California is approximately 10.5 mi (16.9 km) to the west of Lake Cachuma. The town of Santa Ynez, California is approximately 7.25 mi (11.67 km) to the west of Bradbury Dam. Santa Barbara County Parks offers a variety of natural programs including wildlife lake cruises, nature walks, junior ranger programs, campfire programs on summer weekends, and a family-oriented live animal event in the fall. School and community group environmental education field trips are available all year. Located in Santa Barbara, the Neal Taylor Nature Center, formerly the Cachuma Lake Nature Center, features exhibits and hands-on displays about the area's cultural and natural history, including local plants, animals, birds and geology. The nature center is open year-round and admission is free. The center offers youth and adult workshops and lectures as well as school and youth nature education programs in partnership with the Santa Barbara County Parks natural history programs. 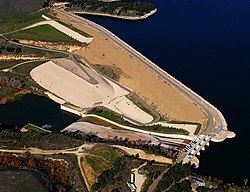 ^ "LAKE CACHUMA DAILY OPERATIONS" (PDF). 23 January 2017. Retrieved 28 January 2017. ^ "Rainfall and Reservoir Summary" (PDF). Santa Barbara County - Flood Control District. March 28, 2019. Retrieved March 28, 2019. ^ Bright, William; Erwin Gustav Gudde (1998). 1500 California Place Names: Their Origin and Meaning. University of California Press. p. 29. ISBN 978-0-520-21271-8. ^ Ethan Stewart (April 21, 2011). "Paddling the Forbidden Waters". Santa Barbara Independent. 25 (275). p. 8. Retrieved December 30, 2011. ^ "October 2016 Lake Cachuma Daily Operations" (PDF). CVO 2016 Reservoir Operations Reports. U.S. Bureau of Reclamation. Retrieved January 19, 2019. ^ Bolton, Tom. "Lake Cachuma in Santa Barbara County rising fast after potent winter storm". The Tribune. Retrieved 24 February 2017. ^ "Cachuma Reservoir". County of Santa Barbara Public Works Online. Retrieved 24 February 2017. ^ John Palminteri (September 30, 2018). "Cachuma Lake water supply holding up despite prolonged drought and weak winters". KEYT. Retrieved February 5, 2019. ^ Vasoyan, Andy. "Water Worries Waning After Wet Winter, According To Santa Barbara City Council". www.kclu.org. Retrieved 2019-04-10. 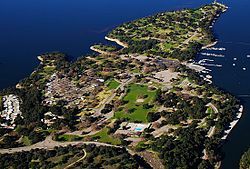 Wikimedia Commons has media related to Lake Cachuma. This page was last edited on 10 April 2019, at 04:02 (UTC).